Adam Myłysz won a silver medal in ski jump competition in Vancouver 2010. Adam Myłysz won a silver medal in ski jump competition in Vancouver today. Małysz wept silently when the Polish anthem was played. Every Pole would. Whistler (AFP) - The legend lives on after Swiss ski-jump superstar Simon Ammann won gold in the normal hill on Saturday to clinch the first precious metal of the 2010 Olympic Winter Games. "This is my third Olympic gold medal, it's insane. I have no words for this, it's crazy," said the 28-year-old, who pulled of a golden double at the Salt Lake Games eight years ago to earn the nickname Harry Potter, the young wizard he resembles. "It's an incredible day. Here I am eight years on, bringing such concentrated energy and strength and the experience gained from my career to the hill once again. "I just knew I could do it if I was calm and relaxed - which I was." Ammann flopped in Turin four years ago but this time there was no stopping him as he crushed the competition, leaving Adam Malysz of Poland to claim silver and Austrian Gregor Schlierenzauer the bronze. Ammann served notice he meant business with a first round effort of 105 metres at the Whistler Olympic Park and then followed up with a mammoth 108m to total 276.5 points and leave his fellow podium finishers trailing in his wake. Malysz jumped impressively too -- 105.5m and 105m for a total of 269.5 points -- while Schlierenzauer produced leaps of 101.5m and 106.5m, the latter effort putting some pressure on Ammann. Called on to pull out something special, the Swiss promptly obliged with his second leap pulverizing Malysz's hopes that he would improve on the silver he won eight years ago on the large hill at Salt Lake. "Eight years ago it was easier for me, I was new. This time, I was up there as the last jumper. I knew I had to concentrate hard as I knew I had to jump far. "Now I want to cherish the moment. I have had great fortune in my career so I am delighted," said Ammann, who arrived in Canada buoyed by five World Cup wins this season to top the overall standings. Malysz said he was proud of his silver, which made him the first Pole to win three Winter Games medals, even though none were gold. "It was a very tough competition and I was up against it. But I'm happy with my showing," he said. Finnish veteran Janne Ahonen was visibly disappointed having come out of retirement in the hope he could emulate countryman Jani Soininen, who took gold at Nagano 12 years ago. But jumps of 102m and 104m proved insufficient as he totalled 263 points, ahead of fifth-placed Michael Uhrmann of Germany. Two Slovenians brought up the rear -- Robert Kranjec, with Peter Prevc, only 17 years old, finishing an impressive seventh. Schlierenzauer, with 32 World Cup successes already, said he was happy to land bronze at his first Oympics. "My dreams are coming true already - and I hope there will be more as the Games go on. A medal is a medal - it's really cool." Thomas Morgenstern of Austria, large hill champion four years ago, failed to reproduce that form but said: "Ammann is a worthy winner. And I am an Olympic champion - you can't take that away from me." Małysz has won his second silver medal in ski jumping competition. Justyna Kowalczyk, ski runner, won bronze. That is great news for you and Poland. Poland aren't doing well with Olympic 2010. Compare to American people, like I said all the times we American have lot of skills and handling pressures very well. I noticed Poland only win 4 medals and American win 23 medals yesterday. Now let us see how much did Poland do? Good Luck. Polish population of 38 million won 4 medals. American of 308 million won 24. Nor does Poland spend the money on it's players, like we do here. I think Poland is doing a great job. You can't compare the USA with Poland, but than Arlene, you have never been to Poland to know of what I talk. I hope some day you will go. Well, you are absoluting right about it. Don't count America, America is very more populations than Poland. I looked this way, Poland and Germany are about same size countries and somewhat same populations too. Germany have 14 medals than Poland. I do not want to hurt Polish people. You do take nice pictures of Polish winners. Beautiful people too. You always compared with American women and Polish women. What is different. How come you are still in America? I looked this way, Poland and Germany are about same size countries and somewhat same populations too. The Polish population of 38 million isn`t the same as German population of 82 million. ermany have 14 medals than Poland. Yes, Germans have better sportsmen/women. do not want to hurt Polish people. You do take nice pictures of Polish winners. Beautiful people too. Polish ski-jumper Adam Malysz has come third overall in the World Cup classification after the last competition held today in Planica, Slovenia. In Sunday’s competition, Polish ski-jumper Kamil Stoch came first, jumping 215.5 metres. Adam Malysz came third with 216 metres, although lost out on points, as did second-place Robert Kranjec from Slovenia, who managed to jump 224.5 metres. Sunday saw Adam Malysz’s last jump of his professional career, with the “Eagle from Wisla” coming third overall in the FIS classification after Thomas Morgenstern and Simon Amman, from Austria and Switzerland respectively. Malysz managed to gain a podium finish after overtaking Austrian Andreas Kofler, who held a small lead over the Pole in points before today’s competition in Planica. Although today marks the end of Malysz’s career, Poland’s legendary ski-jumper is organising a “farewell” party for his fans in the Polish resort of Zakopane on 26 March. Over 20,000 fans are expected to come to the Tatra resort of Zakopane tomorrow for a farewell gala in honour of Polish ski jumper Adam Małysz. He is to jump for the last time in his long career, in the presence of his former rivals Sven Hannavald and Andreas Goldberger, as well as President Bronislaw Komorowski. The successes of Adam Małysz, now 34, include four Olympic medals, four World Championship titles and twenty one national championship titles. He is married, with one daughter. The Polish Olympic Committee has offered Małysz the post of Poland’s attache for the Winter Games in Sochi. He said he would take decisions as to his future acitivities after some time. According to sociologist Jacek Wasilewski of Warsaw University, Małysz, even though no longer present in competitive sport, remains a celebrity whose image could be used with a huge success in publicity campaigns, particularly by banks and insurance companies. Entering politics on the other hand, Wasilewski says, would mean an end to Malysz’s career, because his support for any party would destroy his image of a person who brings together all Poles. Way to go Poland, and soon you will be number 1. Last posts here are from 2011 when Adam Małysz ruled the ski jumping world. 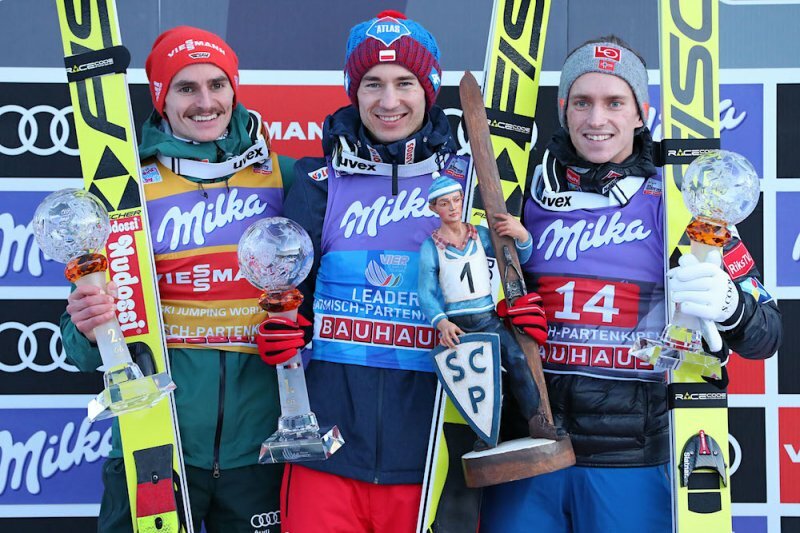 Today Kamil Stoch has taken over and he has just won the second contest this season.